With Barnum-esque hype, a circus announced that Bigfoot has been captured and will be on display June 7 in New York City. "For the THRILL OF A LIFETIME come see the strangest creature EVER brought to civilization before he is safely released back into the wild," reads one poster for the event. An outfit called the Tiny Top Circus says it is hosting the public exhibition at Washington Square Park in Manhattan's Greenwich Village. "He is a sight to see," circus rep and noted hoaxer Joey Skaggs told The Huffington Post. "You will not want to miss this!" Skaggs has pulled a prank or 10 before. "Give the media a sensational story and they’re all over it," he has said. Oh, Joey, we so wanna believe this time. The elusive and possibly fictional beast has already left quite a digital footprint on HuffPost, especially concerning hoaxes. So anyone who shows up at the display might want to heed the words often credited to P.T. Barnum himself: "There's a sucker born every minute." 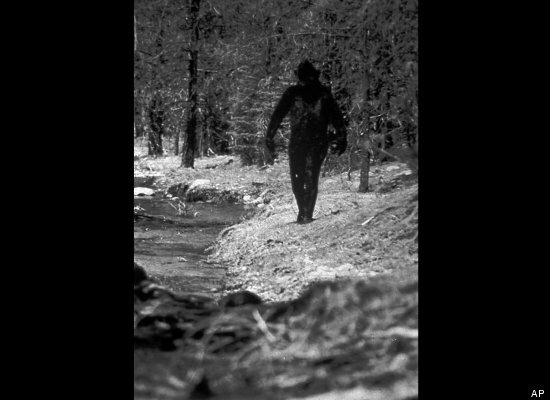 This still image taken from a 1977 film purports to show Bigfoot in California.